I'd like to thank HaperCollins and Edelweiss for providing me with a copy of this book to read and review. Receiving the book for free has in no way altered my review or opinion. I saw this book around a while back. It sounded really cute, but I wasn't sure if I would like it or not. When the chance to read it came up on Edelweiss I thought I'd give it a try. And I'm so very glad I did. I have so much love for this book and I really can't wait to read the books that follow! This one was light-hearted and fun while still addressing some serious issues that young teens endure. What worked for me the most was the way the author mixed humor into the serious situations. I know there are a lot of people who don't get British humor, but I find it hilarious for the most part. I definitely found myself laughing out loud at this book, people throwing me odd looks as they wondered what I could possibly be reading. After reading quite a few heavy and emotional YA and NA books recently, I really needed this humor to break things up. Harriet is super endearing. You can't resist her. She's quirky and silly and overall she thinks she's just a Geek. And so do many others at her school. 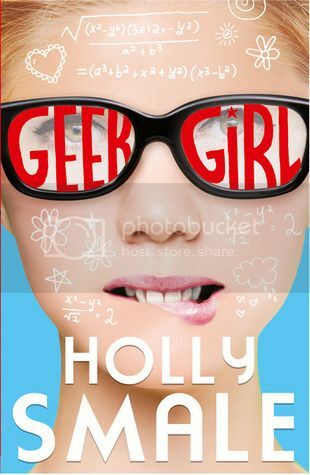 And while the book starts out and you think Harriet is ok with her Geek status, you do find later that it irks her a bit that she's not as accepted as others. But what I loved most about her character is how much she grew and changed so that she really started to feel absolutely comfortable with herself. You get the bullying side of school, because of course Harriet has to have a nemesis (even though she can't figure out why on earth this girl, who used to be her friend, hates her so very much) and you also get the friendship side (I loved Nat and how supportive of Harriet she was, even when Harriet thought she would not be). And you get a little bit of romance, that first crush and attraction that most young kids wonder what to do with when it sneaks up on them. I loved Harriet's relationship with her step-mother the most. Since Harriet's mom is no longer around, this woman is all she knows. And while she seems to tolerate her more than anything else when Harriet first introduces her, you find that throughout the book Harriet starts to understand how much of a mother figure this woman has been. And also how much she truly cares for Harriet as if she's her own flesh and blood. It takes Harriet time to come to this realization, and the realization that perhaps she is more like this woman than she cares to admit. I love how Harriet gets advice. And Wilbur, how can we forget Wilbur and all his quirky names for Harriet. He certainly helps her realize that she is more than just the "ugly duckling" she sees herself as. He helps her come into herself and shows her just how much she has to offer, to everyone (including Nick, who seems to have taken a shine to her). Holly fell in love with writing at five years old, when she realised that books didn't grow on trees like apples. A passion for travel, adventure and wearing no shoes has since led her all over the world: she has visited 20 countries, spent two years working as an English teacher in Japan, volunteered in Nepal, been bartered for in Jamaica and had a number of ear-plugs stolen in Australia, Indonesia and India. As a teenager, she also did a little modelling in the hope that eventually she would be sent somewhere exciting. Holly has a BA in English Literature, an MA in Shakespeare, and currently lives either in London or @holsmale.